There are several types of adverts when it comes to the internet adverts system. Website/Blog owners can earn money from these kind of adverts listed below. Pay Per Impression: You as the blog owner receives a certain amount of money whenever an advertiser's advert appears on your website. Pay per click: As the blog owner, you get paid each time your site visitor clicks on an advertiser's adverts on your site. Please be careful not to click on ads being served on your site. Pay per action: I like to call this pay per conversion. As the blog owner, when your blog/site visitor clicks on an Ad from your site and actually carries out the action the ads were meant for. Eg a blog visitor purchased an item he saw being advertised on your blog. Let me now introduce you to some forms of adverts. These are the way the adverts appear on your site. These adverts generate revenue for the site owner whenever a site visitor views the advert. This simply means you as the blogger get paid based on the number of views(impressions) the advert got from your site. These are adverts that usually appear between texts in your blog. The ads appear whenever there is a text relating to the advert on your article. 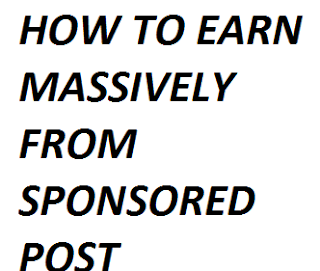 These adverts will only appear on your blog if your content is related to the advert. This means if you are a tech blogger there is no way a pet training advert can appear on your content. Google Adsense is the largest contextual ads network with over two million subscribers. Remember you only get paid per click in this form of Advert. This is when you as a blogger offer a space in your blog for sale. A start up can purchase this space to its product and services. These are mostly banner ads with text inscriptions on it. I can not tell you how much revenue you will earn from this as it varies depending on the popularity of your site. You may decide to promote a new website in your own blog by helping them upload an article written by them. Depends on the kind of site you are promoting a sponsored post for you should add a NOFOLLOW TAG or DOFOLLOW TAG. You can as well write a review about other companies and get paid handsomely. My advice to you as a blogger is to work hard and build a loyal audience and in no time the request for sponsored post by companies will start coming. Hope you enjoyed this article? if yes, please share with your friends and let us know your thoughts on the comments box.